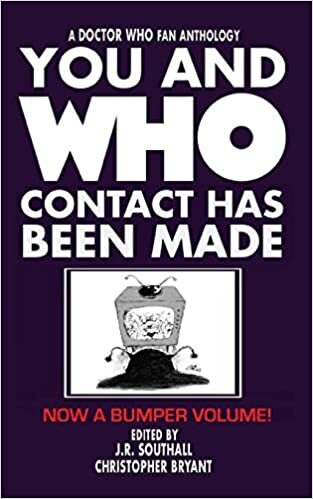 In 2015, the two volumes of You and Who: Contact Has Been Made were reprinted, and a bumper all-in-one volume with additional material was also released (shown above). The two original volumes were printed in 2013. These books included essays on every single episode of Doctor Who up to its 50th anniversary. My two essays were on The Wheel in Space and Planet of the Dead. All proceeds from the You and Who books go to Children in Need. Following is an excerpt from the first essay. I could include the entire essay here (the rights reverted to me), but I’d prefer it if you bought a copy to maximise the proceeds raised for the charity. The parents of any small child will tell you there’s a moment when you just can’t face another instalment of Yo Gabba Gabba. And, after a while, the prospect of having to sit through twenty more minutes of Wow! Wow! Wubbzy! can cause you to throw up in your mouth. So imagine my joy when I realised that my three-year old son, Danny, was old enough to survive watching Doctor Who unscathed. Well, the less scary episodes anyway. Probably. Close enough to risk it. And if there is long-term psychological damage? Ha—they’ll never trace it back to me! On hearing my plan of action, my wife, Megan, (a wholly lovely and astonishingly patient woman) pleaded with me to pre-watch the episodes, just to make sure there was nothing too terrifying in them. But with two small kids in the house, there wasn’t sufficient time to pre-screen the prospective episodes, so… I plunged ahead regardless. Reckless much? We’ll circle back to that idea later. But first, a digression: a year before we started watching Who, Danny found my Dalek-shaped bubble bath bottle and promptly fell deeply in love with it. As a two-year old in Texas, I think he was unique in knowing that Daleks shout “Exterminate!” More than that, he was probably the only two-year old in these parts to even know the word exterminate, let alone run around the house shouting it out at the top of his lungs. When Danny and I sat down to watch an entire episode, the first thing I said was; “Tell me if it’s too scary, right? Daddy can put his hand over your eyes for those bits.” The look he gave spoke volumes. As if, he seemed to protest, I am so not missing the good bits. Careful consideration was given to our first full Who story. I decided on The Krotons because I’d seen it recently and didn’t remember anything too horrible. Besides, Danny saw the DVD box cover and thought the Krotons were robots, and Danny loves his robots. Another minor digression: Danny has created a game called Robot. This game involves making me sit on the floor and then running straight at me, full tilt. He pushes me over, clambers all over me, and tries to whack seven shades out of me. “Is this wrestling?” I ask him. “NO! Silly Daddy! It Robot!” In reply, I tickle him, but he protests loudly that we are NOT playing tickle, we are playing ROBOT and I am doing it WRONG. Lately, the rules have changed to require Danny to hop three times before he can run at me. I’m sure next week the rules will be different again. I suspect every version of the rules will require him to pummel me. Oh, yeah, The Krotons. He loved it. Apparently, he’s the perfect age for it (I’m not sure that’s what the people who made the programme had in mind). Buoyed by this enthusiastic reception, we went on to The Dalek Invasion of Earth. The opening sequence of a man drowning himself caused a couple of awkward questions (“What he doin’, Daddy?” “Um, he’s going swimming.”). Highlights for my three-year old fellow viewer were the alligator that threatens Susan in the sewer and EVERY SCENE WITH A DALEK IN IT. We followed the Dalek story with Tom Baker’s debut, Robot, (are you surprised?) and then Remembrance of the Daleks. At this point, I was exhausting my supply of Dalek stories, so we went onto The Seeds of Death. “Where’s the Ice Warr, Daddy?” he said roughly thirty times an episode, not quite being able to pronounce warrior, “When they come back?” “They’ll be in the next scene, hang on.” The Doctor floundering in the bubbles made his week—it was the funniest thing he’d ever seen. Then Danny saw the DVD box of The Visitation. It has a robot on the cover, so of course he wanted to watch it. Nothing bad sprang to mind about the story, so I popped the disk on. And all was well until we got to the very end—and the Terileptil burns to death. Never has a father’s hand shot over a little boy’s eyes so quickly. Let me tell you, I was not appreciative of the production team’s decision to show a second shot of the alien’s skin bubbling in the flames. That night, as I tucked him in, he said very seriously, “Doctor Who not scary, Daddy.” Silly me for worrying. To buy a copy of this book on Amazon, click here. Contributors include: Phil Ford, Paul Castle, Mike Morgan, and many others.